During the LEM357-pedition some weeks ago the conditions were mediocre overall. Coronal holes one after another and at the end of expedition an increased proton level made trans-Atlantic propagation lousy. On Friday, October 23 around 05 UTC, in the “middle” of a minor proton storm, we found the band more or less empty with the exception of weak La Plata signals, especially on the lower part of the band. Because the band was so clean even many of these signals were readable. We found that the cx favored stations from the Northern and Northwestern corner of Argentina. 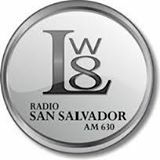 One of the stations identified was LW8 Radio San Salvador de Jujuy on 630, a frequency almost always giving only the Buenos Aires station R Rivadavia during La Plata cx. Now, at 0501 UTC a clear ID was noted “LW8 Radio San Salvador de Jujuy 630 kcs, oficinas en Horacio Guzmán 496 en Radio Visión Jujuy…”. This was indeed a big surprise. Pertti Äyräs heard LW8 probably for the first time in Finland on October 16, 2014, almost exactly on year earlier. My report was rapidly verified by Rodrigo Martearena, Jefe Comercial y Marketing, Radio Visión Jujuy. Mil gracias Rodrigo. This becasme my QSL # 160 from Argentina!